Kasumi ga Castle (霞ヶ城), aka Nihonmatsu Castle (二本松 城) is the ruins of hilltop castle located in Nihonmatu, Fukushima prefecture. It is one of the spots of Boshin War and the battle of Aizu. Today, it is popular Sakura spots in Fukushima prefecture. 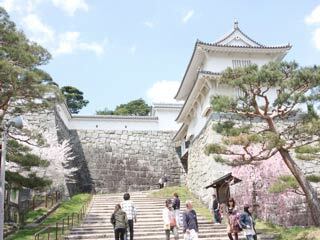 It is chosen as both 100 best castles and 100 best Sakura spots. In the end of April, over 4,500 Sakura bloom and tell the arrival of Spring. enter now. Because of the earthquake happened in March 11, 2011. Stones are not steady and they are very dangerous. Built in: Middle of Muromachi Period middle of 15th century by Hatakeyama clan. Nihonmatsu castle is located on the top of Mt. Shirahatagamine. Tenshu-kaku and the main bailey is located at 345m high. It was used to be ruled by Hatakeyama clan, but in Sengoku period, Date Masamune attacked this castle in 1585. Hatakeyama Yoshitzugu once surrendered to Masamune, but he kidnapped the father of Masamune. Masamune shot both Noritsugu and his own father and killed them. In 1586, Masamune defeated this castle and put it under his control. In 1591, Masamune was moved to Iwadeyamashiro, and Gamo moved to Aizu, and settled Nihonmatsu castle as his brunch castle. After the battle of Sekigahara, in 1643, the grandson of Niwa Nagahide, Mitsuhide, moved to Nihonmatsu and became the lord of Nihonmatsu domain. Niwa clan ruled this castle until the end of Edo Period. In 1868, Boshin War happened and Nihonmatsu domain joined the union of Ouetsureppan (Tohoku Union) However, this castle was defeated by the new government. ... is teenage Volunteer Soldiers during Boshin War. Just like Byakko-tai of Aizu domain, they died at the war. Stones of Honmaru, and the main gate were reconstructed.